What Will You Have to Give Up To Have An Emergency Fund? 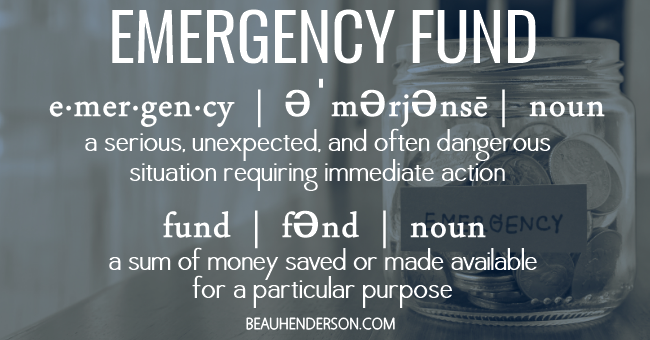 What Will You Have to Give Up in Order to Start An Emergency Fund? A recent survey conducted by Bankrate.com found that 30 million Americans tapped into their retirement savings during 2011 to cover unexpected expenses. The Wall Street Journal found that one in four households don’t have emergency funds, and of the households that do have these savings, more than half don’t have the recommended amount. This is one area of your financial plan you don’t want to overlook, because even if you are doing everything right – saving for retirement, paying off debt, eating your vegetables – not having an emergency fund can get you into real trouble. #1: It helps you avoid the credit card emergency trap which keeps you out of debt. #2: It protects your retirement plan so your funds can enjoy the benefit of tax-deferred growth, dollar cost averaging and the power of compound interest. #3: It gives you security. When you know you have the funds to cover unexpected expenses, that leads to peace of mind and sleeping well at night, both of which only improve your RichLife. Establishing an emergency fund isn’t rocket science. Anyone can do it, regardless of how little or how much money you make. So what’s keeping you from getting started? Afraid you’ll have to live on a budget? When Was The Last Time You used The “B” Word? 1: Give Up Your Misperceptions: Most people think that saving is something rich people do. Saving regularly is what you do to get rich. It’s a function of the mind, not of the wallet. Make it a habit: save a percent of whatever you make, no matter how little you make. 2: Give Up Your Procrastination: The person who waits until they can save more will have $0 in their emergency fund at the end of the year. The person who starts today and puts in $100 a week will have somewhere in the neighborhood of $1,400 saved by January 1st, plus the earned interest. The cool thing about getting started is that when you see your account balance grow, you’ll be motivated to save even more, which means you only have to give up your procrastination once. After that, you’ll be motivated. 3: Give Up Your Worry: When the car overheats, when the water heater breaks, when your son or daughter wants to go to hockey camp – you’ll be prepared. There won’t be that sinking feeling in your gut, Oh no, how am I going to afford that? The best way to make saving truly worry-free is to put it on automatic pilot. Have a percentage of every paycheck or deposit automatically withdrawn from your checking account and put into your rainy day fund. Whether that amount is $5 or $500, just get it started. Do it once, do it today, and then enjoy the peace of mind that saving brings.